Carts are mandatory on weekends and holidays until 2:00 p.m. during the season starting on the second Saturday in May through the second Sunday in September. Each person shall have a current playing ticket for the day which shall be his/her authority to play or practice and the golfer shall show the same whenever requested by the course superintendent, golf professional or any authorized employee working at the Golf Course. Persons not playing, but walking with a golf group, shall sign a waiver and have a copy of said waiver for the day in their possession, and shall show the same whenever requested by the golf professional or any authorized employee working at the Golf Course. All players shall start playing only at number one tee unless specifically authorized to start at another tee by the Golf Starter, and shall not play at any time until the players ahead are out of range. Golf Starters shall properly space golf groups (every eight minutes) to ensure speed of play and safety on the course. All players shall register at the clubhouse before starting to play or practice. No person, except those authorized by the Golf Course Superintendent, shall be on the golf course after dark or after the closing hour. No person shall play on any green when prohibited by the Golf Course Superintendent. Persons playing more than one ball shall be directed to the practice area, by the Course Golf Ranger or Starter. No person shall practice in any area except the driving range. No person shall drive or park a vehicle on the grounds, except those authorized by the Golf Course Superintendent. No person shall be on the playing or practice areas of the golf course during the regular golf season other than County employees performing their assigned duties, law enforcement personnel in connection with the law enforcement activities, and personnel authorized by the Conservation Director, Golf Professional, or Golf Course Superintendent, except while engaged in golf playing or practicing activities with proper receipt, or walkers, with waiver signed, and walking with a specific group. No person shall play golf on the golf course without a golf bag and four clubs and proper playing receipt. No person shall play on the golf course in a group larger than a foursome, that is, containing no more than four persons. No more than two persons or two golf bags shall ride on a golf cart at the golf course and the driver shall have a valid drivers license and shall be responsible for any course damage or golf cart damage due to reckless driving or unruly behavior. Motorized golf cars shall be driven on specific golf car paths whenever possible and shall remain 30 feet from greens and off all tee box areas. At the golf course, the 90° angle rule shall be in effect. No cart should be on any park road for any reason. Proper golf or tennis shoes are required, no soccer cleats, no barefoot golfers. Shirts must be worn at all times. Alcoholic beverages must be purchased from the clubhouse. Violators may be dismissed from the course. Repeat violators may be further disciplined. All leagues, tournaments and special events shall be scheduled with the golf professional. USGA rules will govern all other play. No private golf carts allowed. Children under 12 years of age must be accompanied by an adult 18 years of age or older, who accepts responsibility for their safety and behavior. Children not accompanied by an adult as specified above, will not be allowed on golf course property. 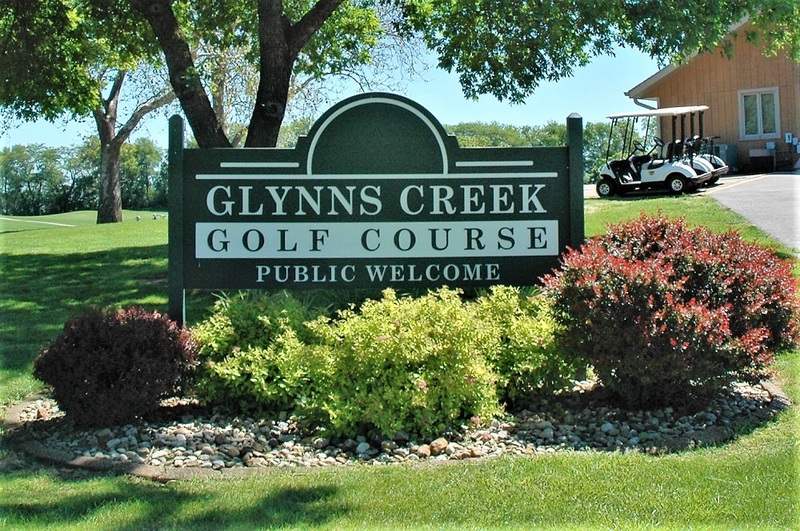 Golf Course property includes the golf course, clubhouse, driving range, and all surrounding property designated as Glynns Creek Golf Course. CART RENTAL - Minimum age for cart rental and/or operation will be 18 years of age. DRESS CODE - In order to provide our public with a comfortable and family oriented environment, the golf course staff and the Scott County Conservation Board have instituted the following dress code for Glynns Creek Golf Course. Appropriate shirts and shoes must be worn at all times. Shirts should extend to the waist. Tube tops and midriff tops are not appropriate. Tee shirts are acceptable. No bathing suits or bathing suit tops will be allowed. Shoes should be golf shoes or flat bottom tennis shoes. Soft spikes are required. No shirt or item of clothing should have any profanity or offensive slogans, logos, pictures or content. All players agree to the above rules simply by purchasing greens fee. The Conservation Board reserves the right to remove or refuse services to those persons not abiding by the dress code. YOUTH - Eleven years and older may golf without adult supervision. Ten years and younger must have adult supervision to play golf. Exception: Those ten years of age and younger who have successfully passed the "Junior Golf Certification" will be allowed to play golf without adult supervision.